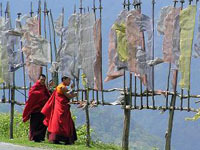 In the east of Wangduephodrang, the great monastery of Gangtey dates back to the 17th century. A few kilometers past the monastery, on the valley floor is the village of Phobjikha. This place is the winter home of black necked cranes that migrate from the arid plains in the north to pass winter winter in milder and lower climate.